List Rules Vote up the coolest Japanese arcades that just shot to the top of your Japanese travel to-do list. Your local arcade may have boarded up its doors a few decades ago, but in Japan, arcades are as popular as ever. It should come as no surprise you can find some of the coolest arcades in the world in Tokyo, a gamer’s paradise. With its neon lights, endless sprawl, countless nooks and crannies, and chaotic crowds, Tokyo itself feels a bit like a video game. Though Tokyo is the center of Japan's arcade culture, most Japanese towns have at least one arcade, known as a gesen (a shortened, Japanized version of the English phrase “game center”). After a long day at work or school, many head to the arcade to play a game of pachinko, take pictures with friends at the photo sticker booth, or reclaim their high score at a favorite game. Whether you’re looking for a casino-sized arcade with vibrant lights and the latest games or a quiet space housing vintage favorites like Pacman, Japan is your go-to place for some of the best arcades in the world. Possibly one of the most unique arcades in the world, Anata no Warehouse (Your Warehouse), in Kawasaki, Japan, was designed to look like Kowloon Walled City, a once heavily populated slum in Hong Kong. To get to the games, you need to cross over a body of neon sludge via a dodgy stone path. Everything from the bathrooms to the chicken snack shack is weathered, grimy, and dimly lit. The only pristine things here are the games, which give off an unearthly glow in this Texas Chainsaw Massacre-esque landscape. Unlike most arcades, Warehouse is 18-and-over only, probably because of its nightmare-inducing vibe. Check out this extensive walk through video for an idea. Like many game centers in Japan, Taito Station has photo sticker booths. But not just any photo sticker booths. Taito Station photo sticker booths take it to the next level. Maybe you've seen a photo sticker booth in your local mall; they allow users to decorate pictures and manipulate their appearance. You can change your hair color or enlarge your eyes to make yourself look like an anime character. The unique thing about the photo sticker booths in Taito Station is, they have cosplay costumes users can pose in for free. Looking for a video? Got you covered. If you’re a fan of classic video games, you're in luck, because Super Potato is vintage gamer’s heaven. Primarily a store for retro games, Super Potato boasts three floors of gaming goodness. 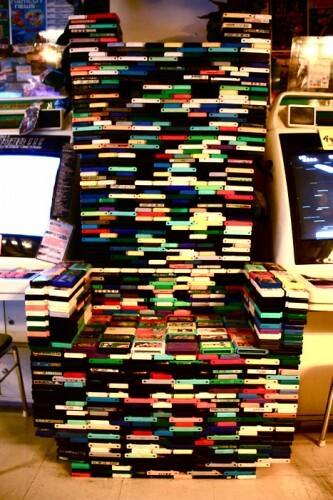 Head to the top floor of the building to get to the arcade and take a seat on a throne made of NES and Sega game cartridges – your very own throne of games. To see the full extent of awesome retro gear and games at Super Potato, check out this crazy walk through - there's more than one giant Mario, and a massive, playable Gameboy hanging from a wall. Located in the Akihabra district of Tokyo, a Mecca for electronic lovers and die-hard nerds, Club Sega is impossible to miss. The arcade is a whopping seven stories high, and the entire fifth floor is filled with nothing but Sega games. If you’re a Sega fan, this is the place for you. Check out the Akihabara streets and the Sega Club in this awesome walk through.